WHIPPANY, N.J. (AP) Morris Claiborne was in the middle of a walkthrough practice last summer when he got the call – finally – that he was eagerly anticipating. A New York Jets trainer had the cornerback’s cellphone and was tasked with letting him know if and when Claiborne’s now-wife Jennifer was heading to the hospital. It was July 30, 2017, and Jennifer was 35 weeks along – two weeks before her scheduled cesarean section. But her water broke while she was watching the couple’s two English Bulldogs outside their home. She had to immediately head to Morristown Medical Center, about 2 1/2 miles away. Meanwhile, Morris zipped from the Jets’ training facility in Florham Park to the hospital just over 3 miles away in time to be there to welcome his daughters. Doctors performed the C-section and first delivered Ma’Kaila, who was quite underweight at 3 pounds, 8 ounces. Ma’Liah came a few moments later, weighing in at a more robust 4 pounds, 13 ounces. Ma’Kaila was immediately taken to the neonatal intensive care unit, separated from her sister – and mother – for the first time. Ma’Kaila stayed in the NICU for the next two weeks, working up the strength to be sent home to her parents and sister. Claiborne’s coaches and teammates never knew of the hectic routine he was keeping throughout the summer. But she had brought Ma’Kaila home from the hospital earlier in the day and had both girls in the bed, laying them beside her with a video camera set on record to capture the moment. ”I wasn’t expecting to see both of them at all,” a wide-eyed Claiborne recalled. ”I wasn’t ready for it at all. When I walked in, I was so used to seeing her (Ma’Liah) in the bed when I’d come in, and when I saw both of them laying there, my heart just dropped. Ma’Liah and Ma’Kaila are now 10 1/2 months old, healthy and full of personality. Ma’Liah, according to Jennifer, is the more demanding of the two, and ”she’s a Daddy’s girl.” Ma’Kaila is still slightly smaller than her sister, but is more independent – moving around on her own, playing and feeding herself. ”It gave me a sense of what I’m really playing football for, what I’m really doing it for,” said the 28-year-old Claiborne, who re-signed with the Jets on another one-year deal in the offseason. ”It’s for my family and bringing these two precious little babies into the world, it opened my eyes to a much bigger picture. 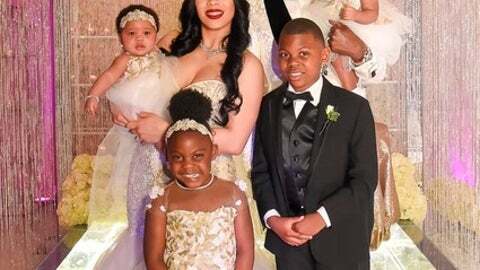 The family was planning to fly to its home in Dallas over the weekend to join Claiborne’s son Morris, who turns 9 in November, and daughter Madicyn, who’s 3, for a special Father’s Day. ”Having these girls made me understand that I really missed some valuable time with my son, but I was off in college (at LSU) and there was nothing I could really do about that,” Claiborne said. ”My mindset was on making a way to feed him at that time. Just having them made me realize how much time at this age that I really missed that I would’ve loved to be there. And Morris and Jennifer, who got married in March in Texas, are still growing their family. They’re expecting another daughter in mid-November. ”I love being a father,” said Claiborne, who Jennifer rates as ”really good” at changing diapers. ”I love coming home to these faces. I love after games, these kids don’t know whether you had a good game or not, they don’t know what went on at practice. They don’t understand none of that. But when I come home, it’s all smiles because they light up when I walk into the room.